"This outstanding book not only delineates powerful conceptual frameworks and tools but is also studded with real-life, captivating examples in organizations that range from governments to biotech firms to Web portals, that illustrate how to make it happen. A tour de force." "This book is a first-rate introduction to the concepts and tools professional marketers use to develop cutting-edge value propositions for key target audiences in a range of health care arenas. It offers both frameworks for thinking about marketing strategy and insights into a range of tactical alternatives. It is a state-of-the-art volume for those in various health care fields who are eager to be better marketers, students who want to join their ranks, and those who simply are wondering what marketing is all about and how it might help their organizations." 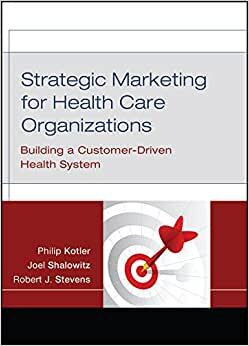 "Kotler, Shalowitz, and Stevens, in this important book, Strategic Marketing for Health Care Organizations, make many valuable contributions to our field, especially their discussion of tradeoffs among the three core aims of any health care system: cost, quality, and access. Students and professionals continually face this problem all the time." "This work places marketing as a core activity impacting all of health care, from prevention to continuing care. It provides a comprehensive foundation for beginners and a valuable reference for experienced managers on a major and often overlooked aspect of management." Philip Kotler is the S.C. Johnson Distinguished Professor of International Marketing at Northwestern University's Kellogg School of Management and the author of more than thirty books. Joel Shalowitz is professor of Health Industry Management and director of the Health Industry Management Program at the Kellogg School of Management and professor of Medicine and Preventive Medicine, Feinberg School of Medicine, Northwestern University. Robert J. Stevens is president of Health Centric Marketing in Durham, North Carolina and an adjunct professor at the School of Public Health at the University of North Carolina at Chapel Hill. An in depth book that is also easy to read for someone with no prior marketing experience. This book was used in a Masters level Marketing class.I thought it was ok.
5.0 颗星，最多 5 颗星Easy to read; yet comprehensive. Very comprehensive yet easy to read. Lots of ideas to get yourself started in healthcare management. This book provides much more detail in his slightly more comprehensive than Thomas's book. It is also required book for our GWU coursework. I like its ability to reference various components of healthcare marketing.